Relics of Sariputra, one of the Buddha's well-known disciples, are shown here. An exhibition of Buddhist relics that drew thousands of viewers in 2006 will return to Honolulu next weekend. The "Maitreya Project Relic Tour" will open at 10 a.m. next Saturday at Kapiolani Community College, Lama Library, 4304 Diamond Head Road. It will be open until 8 p.m. and continue on display from 9 a.m. to 8 p.m. Feb. 17 and 18. The exhibit is free and campus parking is free. 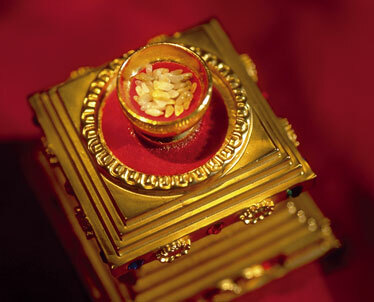 The relics are small, pearl-like granules that some Buddhists believe are the spiritual residue of 28 Buddhas, including the historical Shakyamuni Buddha who originated the Buddhist philosophy 2,500 years ago. "When a Buddha was cremated, the monks would go through the ashes with tweezers and chopsticks," said David Behlke, KCC arts and humanities professor. "Because these men have been praying their entire lives, some of their bones became pearlized, almost like glass. There are some that look like stamens and pistils of flowers and smell like roses. "The Christian equivalent would be pieces of the cross," Behlke said. Artist Phuong Tran said, "Not every lama left relics. For some the remains were a crystal-like form, all colors, not just ivory." He said the relics were formerly kept in temples and never shown nor photographed. Many were salvaged from Tibetan shrines when Tibetan Buddhists fled from 20th-century Chinese invaders. This collection is on a 10-year tour in an effort to raise $200 million to construct a 500-foot bronze statue of Maitreya in northern India. Maitreya is described in Buddhist Scripture as a future Buddha expected to bring teachings of lovingkindness to the world. The relics will eventually be on display at the shrine. Buddhist priests will be at the exhibition to bless people who choose it, said Behlke.